Located to the east of Jiangyin, Jiangsu Province is a communist village that claims to be the richest in all of China. It’s called the Huaxi village and it’s a 24-acre “communist utopia.” It was founded by Wu Renabo, who was the former secretary of the Huaxi village communist party committee. 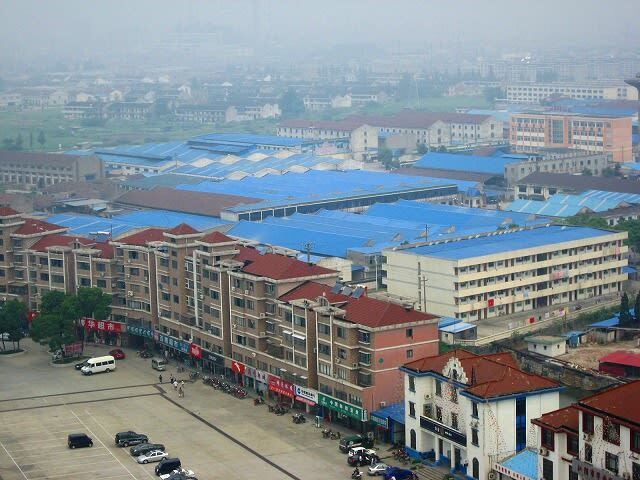 Huaxi used to be a poor farming community but it has since been transformed into a multi-billion dollar conglomerate in the steel and shipping markets. The village’s steel, silk and travel industries have flourished, and this contributed to its $9.6 billion profit in 2012. Part of this profit is divided among its stock-holding residents. Some of the village’s factories. The 2,000 residents enjoy free healthcare and education, luxurious houses and cars (such as Volkswagen or Citroen), free use of the city’s private helicopter, free use of facilities and dining expenses in the city’s luxury hotel, and at least $250,000 in their bank accounts. However, everyone in the village works seven days a week. But if they choose to leave, they stand to lose everything. Rows of uniformed, luxurious villas. Another set of identical villas. Many of the houses have up to 10 rooms! The interiors are just as luxurious as the exterior. And the bathrooms are spacious as well. With plenty of room for guests. It’s said that the village has an annual income of at least $131,800. However, they are not allowed to talk to the press. On top of this, women over the age of 50 and men over the age of 55 also receive a monthly pension with supplementary rice and vegetables. In 2011, the village celebrated its 50th anniversary by erecting Longxi International Hotel, a giant 238-meter skyscraper. The giant monument is said to be able to fit all of the original residents. However, gambling and drugs are prohibited. The hotel has a revolving restaurant, a rooftop pool, a shopping mall, a movie theater, and a spa. One nights’ stay at the most economical rooms for non-residents is at $260 a night. The walls are a testament to the village’s wealth. In the hotel is the village’s $34.6 million 50th anniversary gift to itself in 2011, which is a bull made of one ton of gold. Waking up early, skipping breakfast, and showing up to your first class bleary-eyed and barely awake might not be so bad if you go to these schools. Education is important, and we can't stress that enough. But sometimes, we seriously lack the motivation to get up out of bed to show up for a 7am class. So if getting high grades and earning that diploma aren't enough motivation for you, then maybe you'll be inspired to show up for class if your school is absolutely stunning. These schools aren't just concrete blocks where professors drill information into your head; they're works of art that just might liven up your mind for learning!